Patch asks readers to vote in an online poll, “Should Cars be Allowed in Prospect Park?” As of this posting 85% of respondents said no. The Brooklyn Paper reports that the 78th Precinct wrote 188 tickets to cyclists over the past four months for such infractions as “running red lights, speeding, and riding against traffic.” As a comparison, the 78th wrote just 22 speeding tickets to drivers for the entire precinct in January. 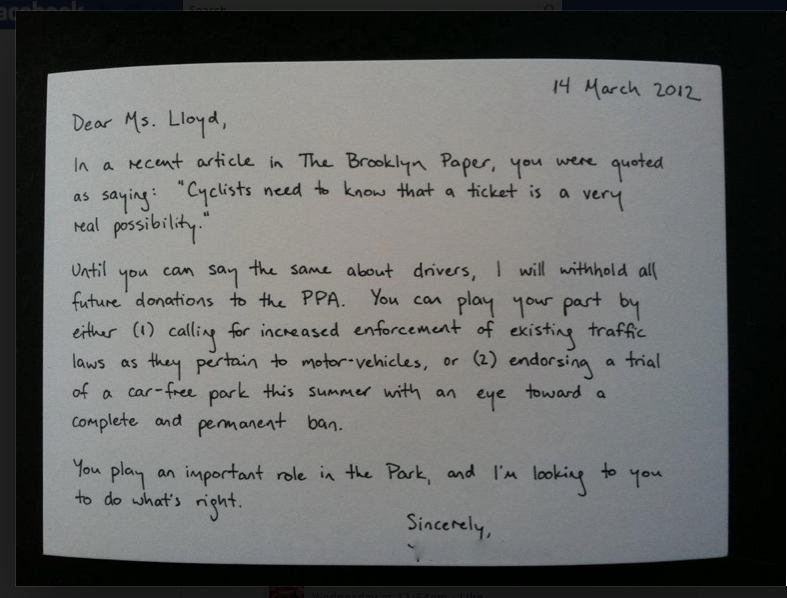 A member of the Car-Free Prospect Park Facebook group dropped off a hand-written note (above) to Prospect Park Alliance President and Prospect Park Administrator Emily Lloyd at the Litchfield Villa on Wednesday. And here’s proof that it ain’t working stiffs who need to drive to Prospect Park.